Kingdoms of Amalur features "5 distinct regions... 4 playable races, and 3 class trees with 22 abilities per tree." The four playable races are the Almain (Civilized Humans), the Dokkalfar (Dark Elves), the Ljosalfar (Light Elves), and the Varani (Nomadic Humans). The player starts off as a "blank slate", but can afterwards choose a class among the three available in the game, which are called Might, Finesse, and Sorcery; they correspond to the fighter, rogue, and mageclasses respectively. The player can invest in a skill-tree system to unlock various "destinieswhich act as the class system for the game. Combat is based on the timing of button presses, similar to an action RPG, with occasional quick time cutscenes like those in the God of War series. 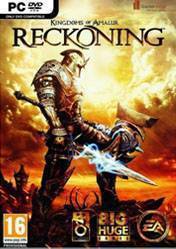 The combat includes a new rage system known as fate which allows players to enter a berserker state called "Reckoning Mode" to quickly dispatch a number of enemies, earning an experience bonus. The player can also "Fateshift" a single enemy during this state which will allow them to perform a brutal finisher following the rapid pressing of a random button, this will also dispatch all other enemies weakened during this time. It's pretty good. Not excellent but good. Designed by the same guy as Oblivion, and much better. Definitely give it a shot. Vraiment pas mal ! Original ! Honirique ! Très beau ! Allez y ! Good game, i love it! This is a cool action rpg, with top notch combat gameplay and a vast world to explore.